Experience the first International through the eyes of players who lived it. 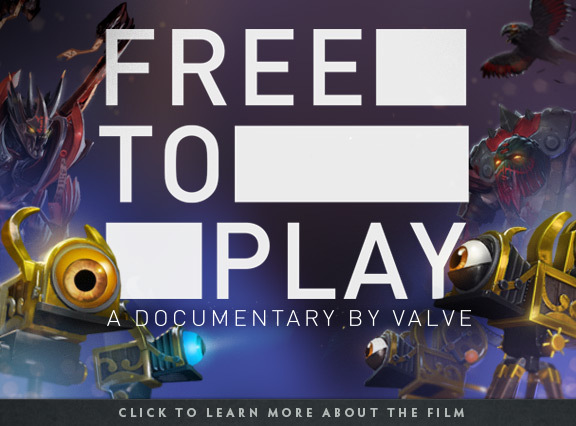 Free to Play is Valve’s feature length documentary detailing the efforts of three Dota 2 players as they battle to win the first million dollar grand prize in the history of competitive videogames. Free to Play will be available for free on Steam March 19th. When the film is out, you’ll be able to show your support for the featured players by purchasing the Free to Play Competitor Pack, which will be available through the Dota 2 Store and Steam. With the Competitor Pack you’ll receive several in-game rewards including pro player item sets for Pudge, Doom, and Sven. You’ll also obtain a Free to Play courier, a special ward, and a custom HUD skin. Plus a portion of each purchase will go toward the players featured in the film: Danil “Dendi” Ishutin, Benedict “HyHy” Lim, and Clinton “Fear” Loomis. Visit the Free to Play website to watch the trailer and learn more about the film.